As of November 29, 2012 the Minersville Pharmacy opened on the corner of Sunbury and Front streets in Minersville, PA. The pharmacy, designed by Watkins Architect, was one of the few new shops and cafes that have opened within the downtown business district of Minersville. 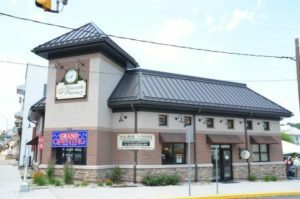 The one-story building with a drive-through window and a 10-vehicle parking lot was a long time in the making for the owner, Carmen DiCello Sr. He spend three years searching for the right location for the pharmacy. 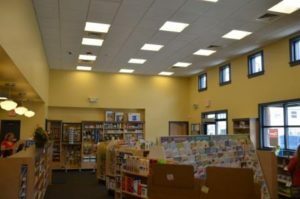 During that time he found that many of the buildings in the area needed a lot of work leading to his decision to purchase three separate properties to create the single lot this pharmacy is now on. Next Next post: Folino Estates begins! Watkins support staff members were always available and a genuine customer service attitude gave me the feeling like my job was the most important one they were working on. The construction project should have taken nine months to complete. With fast track scheduling by Watkins Architect and constant monitoring, the successful completion was achieved in four months. This further exemplifies the quality of drawings, specifications, and cooperation that prevailed on the project. I fully recommend Watkins Architect, LTD to perform your architectural needs when planning, customer service, and post project completion services are required. Mr. Watkins and his staff exemplify all the qualities of a true professional organization. Mr. Watkins and his staff exemplify all the qualities of a true professional organization. What impressed me most was the follow-up and attention to the projects during the construction phase. There were bi-weekly construction meetings with contractors, subcontractors, and township personnel in attendance at all meetings. Minor problems were addressed immediately and not allowed to escalate. Both projects ran so smoothly, due mostly to the organizational efforts of Mr. Watkins and others from his office with whom we dealt from time to time. …very professional, courteous, and responsive at all times. During the time we have worked with John Watkins, as well as his employees, we have found this company to be very professional, courteous, and responsive at all times. Following our first attempt at putting our project out to bid, the bids came in higher than our budget. Despite the fact that Watkins had fulfilled all their responsibilities at this point, they went above and beyond our contractual agreement and re-designed and downsized the building without any further charges. In this day and age you will not find companies that will provide this type of support without paying additional fees; therefore, it is our opinion that a better choice would be very difficult to achieve than to use Watkins Architect. We are appreciative of their professionalism, planning, and execution of architectural design work. We want to commend Watkins Architect, LTD for the invaluable assistance they have provided to Tilden Township. Specifically, we are appreciative of their professionalism, planning, and execution of architectural design work. Their efforts helped Tilden Township immeasurably in bringing the most affordable and beneficial plans for our new building. I would find another picturesque parcel of land and ask John to design another spectacular home for me. John Watkins commitment to the ‘Art of Architecture’ is demonstrated in his design of our building. From the beginning, Watkins Architect LTD provided common sense guidance through the conceptual and development stages of the high profile building project that incorporates many areas of study into a flexible teaching space. They were enthusiastic in meeting our program needs and allowed necessary changes without incident. I do believe that John Watkins commitment to the ‘Art of Architecture’ is demonstrated in his design of our building. We would recommend the employment of Watkins Architect, LTD for your school project. We were pleased with Mr. Watkins educational design capabilities. He demonstrated the ability to take our visions and reduce them into a plan design. We were pleased with his promptness and his communication skills during the design process. We would recommend the employment of Watkins Architect, LTD for your school project.